We are just in the middle of the year, but famous Ghanaian Broadcaster, Nathaniel AnokyeAdisi aka Bola Ray has certainly hosted the classiest and most exciting party of 2017. 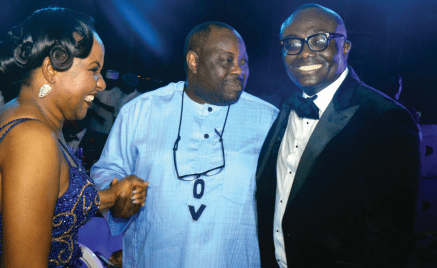 Dubbed “Bola Ray @40”, the spectacular evening was conceptualised by close friends and coordinated by his beautiful wife, Dorcas-and it must be said that they delivered an evening to remember. Bola Ray who has touched many lives with his craft, nurtured many artistes from nothing to something and spread joy to many homes felt like a real King that day. For some this was an occasion to say thank you to a man considered to be a dependable friend Hosted by Starr FM’s Anita Erskine with Comedian DKB as her sidekick, the celebration which unfolded at the scenic Royal Senchi Resort, Eastern Region of Ghana was attended by 300 of the celebrant’s family and friends: His dearest and closest were carefully selected to savour this occasion. On this day, where his incredible success in the media was celebrated, it was an evening of more music, less talk, and so after the opening prayers, the floodgate of performances opened with a praise session by the Tagoe Sisters. Moved by spirit-lifting songs, the celebrant and wife soon joined them on stage, singing and giving praise to God. The Music Maestro, Kojo Antwi was also at his best, he it was who first ignited the party-and there were many memorable moments. He belted his popular tunes which was enjoyed by the couple whose friends formed a ring around them in excitement. Next was the surprise appearance of Marcelito Pomoy, Grand Winner of Phillipinas Got Talent 2011. We heard the celebrant loved Pomoy who has a high-pitched “female” voice and his wife, shocked Bola Ray by flying the singer to Ghana for the party. He gave a good account of himself. The celebrant and wife certainly rejuvenated their love for each other when Sarkodie hit the stage. His was a gentle, slow and easy performance. He serenaded the audience especially the Adisis with his hits, and added a deft touch by introducing a special composition strictly for Bola Ray. It was Shatta Wale who really rocked the party to its very foundation. He was energetic throughout-and his special dance routine became the order of the day for all, especially the ladies who hit the dance floor. That was not all, DJ Vyrusky of Starr Fm was also superb. Knowing full well that the audience was made up of people from different generations, his music selection did not leave any section out. He bridged the generational gap effortlessly. One of the major highlights of the night was the screening of a documentary on the celebrant. There, everyone heard first-hand that it had not always been rosy for Bola Ray. She recounted the early days when he was club hopping and struggling to get clients to pay him. She described him as a hard-working man who is driven by his passion for music, a committed and loving husband and a wonderful father. On his part, Bola told OVATION, that he was thankful to God for everything. According to him during his speech, the evening was wonderful. “I am humbled by this awesome, wonderful, hilarious and outstanding night. This what family represents and this is what friendship is all about. I thank you all. The kind-hearted Bola Ray also used the evening to raise funds for the SOS Children Villages in Ghana. Six of his lovely portraits were auctioned and all the proceeds went to the internationally-recognised charity. This was one party, that many of the guests as they headed to their rooms at about 3am when it faded, exclaimed “Oh What a Night!